"Going to church every Sunday doesn't make you a Christian any more than standing in a garage makes you a car!!" That was the oh-so-clever Facebook update I read last week. I have no idea whether my friend counts himself Christian, or even attends Church. I doubt these words of admonishment are from a regular church goer, though. I don't disagree with the sentiment, but the premise is a bit off. 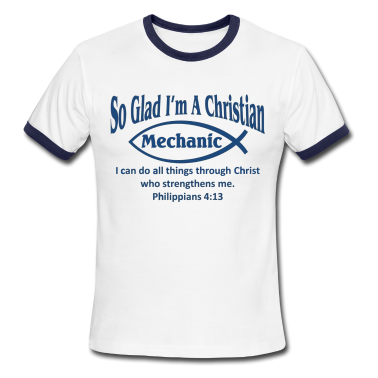 Since a man cannot become a machine, I think my friend might have meant to say "Going to church every Sunday doesn't make you a Christian any more than standing in a garage makes you a mechanic." 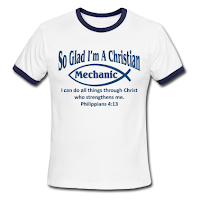 One cannot call himself or hope to be a mechanic without spending a good amount of time in a garage, any more than one who rarely or never attends church can call ever properly hope to be seen a Christian, and certainly one who does not attend Mass at least weekly is at best a Catholic in name only. I say this not to condemn, but to caution; not to accuse, but to encourage. Come and worship with the body of Christ, take your place among the great unwashed, we hypocrites, we the struggling, we the generous, we the meek, we flawed sinners. It may be time for a spiritual tune-up. I had breakfast with a professional associate. We meet regularly and the talk is sometimes about the challenges each of us face. Different industries, remarkably similar challenges. We both learn from each other. We're both in sales. I am in hotel sales, he is in technology. This time the talk took a turn to salaries, and he asked for an idea of what people in our industry earned. I told him how much I made last year He was suprised. I could tell by what he said. "I'm surprised," he said. "I thought you made more." It was my turn to be surprised. I thought I was doing OK. Actually, I am doing OK. I guess I could be making more if I applied my skills and enthusiasm to selling his widgets. but his widgets do nothing for me, and I love the industry I'm in. 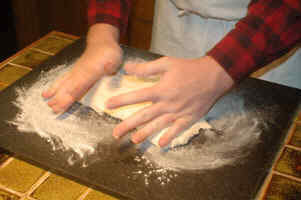 Sure, I'd like to make the kind of dough I imagine he makes, but you can't do that in my bakery. (See what I did there?) The truth is, in his industry I'd be an underperformer who despises his job because I'd be selling a product I don't understand, that I don't believe in from the heart. He'd have to fire me and I'd go back to doing what I enjoy, if they'd take me. My industry, the hospitality industry, doesn't pay a lot, it certainly doesn't pay what most of us are worth. If it did you couldn't afford your burger, frankly. You couldn't afford to stay in my hotel, if it did. It is, however, the industry I love. I study it, dream about it, blog about it and wouldn't trade my career for all the tea in China. Come to think of it, I think the lady at table 12 could use another cup of tea. Gotta go. 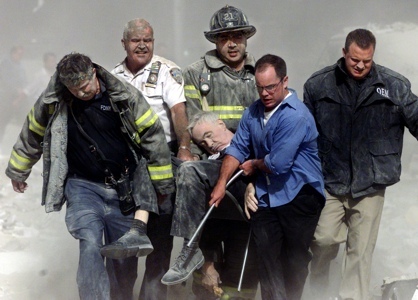 Before a couple of planes hit a couple of buildings in Manhattan, I had never heard a firefighter referred to as a "hero" before. I'm not saying they aren't or weren't, I had just never heard it said. The title has since been bestowed on military casualties in Canada's latest war, and the highway between Trenton and Toronto renamed the Highway of Heroes in honour of the route they take on their final journey after repatriation at CFB Trenton. I have no argument with any of this, and I hesitate to even mention it for fear my words might be misunderstood. John Allemang of the Globe and Mail, on the other hand, minces no words. "Death in a war zone isn't automatically heroic, no matter what Ontario's Highway of Heroes procession route implies." If we overuse a word, it loses it's meaning. One doesn't become a hero simply by employment status, vocation or calling. One doesn't become a hero by the way that they died, but by the actions they took while they lived, sometimes that lead to their death. Just being there isn't enough. Extraordinary action in unusual circumstances on behalf of another, and not on behalf of a country blissfully engrossed otherwise with day-to-day life, but on behalf of a present and engaged other who is in immediate danger. This is my definition. The Merriam-Webster on-line dicationary somewhat supports my definition, and to a degree, that of the common definition of a "central figure in an event, period, or movement". John Allemang says it simply, "A...hero is someone who faces down common sense to do the uncommon thing." If everyone's a hero simply by association, then no one's a hero. That would be a loss to society on two levels, first the loss of yet another word watered down to become a bland modern colloquialism, and secondly the loss of what it truly means to be a hero, notwithstanding the very many examples of truly heroic individual behaviour by the men and women in Manhattan on 9/11, and of the Canadian Armed Forces in Afghanistan. I oppose abortion, and so do you. Here's how I know that you know it is wrong to kill a human being not yet born. Here's the scenario - you see a woman who you know to be pregnant. She's smoking. Let's be honest, we all agree she shouldn't be smoking in her "condition" because it will harm the child. I have even heard people express their belief that their should be a law against smoking when pregnant, and around children. OK, let's add some context to the scenario. She's smoking on the way to an abortion clinic for a procedure. Is it OK to harm the child with cigarette smoke now? I rest my case. This isn't arguing apples and oranges, this is life and death, this is right and wrong, this is good and evil. Years ago we were transferred to Windsor, Ontario from our life in Toronto. Frankly, I had no idea where Windsor was. I knew it was west. That's an understatement. "Get on the 401 highway and head west," were the directions from my boss. "When you get to the end of the highway and someone asks for your I.D., back it up a little. You'll be in Windsor." Windsor is on the border with the U.S. Detroit is across the river. Long story short, that was 18 years ago. In spite of career upheaval and crisis now and then, this has been the best thing that ever happened to our family. We couldn't possibly have enjoyed the quality of life we now enjoy - our neighbours and neighbourhood, our proximity to a major American city while still living in a small town, our friends, our Church, and our well adjusted, well educated and very cool children raised right here. Windsor has been good to us. There's more to a community than house prices. There's more to life than working to pay a mortgage. It's a mainstay of almost every conference or meeting I attend, at which a minor celebrity or inspirational motivationalist (my word) is needed to fill the bill. Someone's climbed Mount Everest and we have to sit and take life lessons out of it. If I sound cynical, it's because I am. I have no doubt that climbing the Mount is hard, so too is running a marathon. I have a tremendous amount of respect for those who have disciplined themselves to do it the once. Frankly, I'm more interested to know what they've done with their lives since and besides before they start telling me how their singular endeavour should inspire me to change my life. I have far more respect for the avid mountain climber than I do for the hobby-climber who, on their first foray, challenges the world's tallest peak. I like the concept, though. Reach for the top. Go towards the peak. Toward the heights! We should all aspire to better. Verso l'alto. 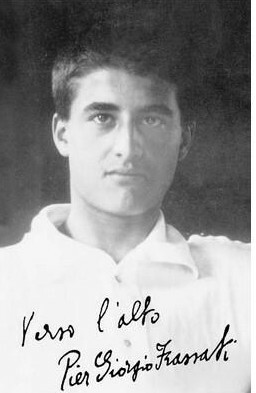 Pier Giorgio Frassati was an avid climber. He was a young, athletic man, handsome and devout. He died at the age of 24 reportedly from a disease contracted while serving Italy's poorest of the poor. 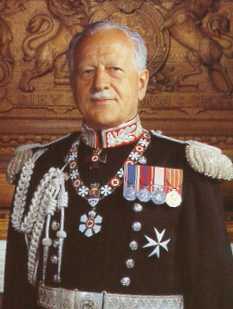 He has been described as a man of the beatitudes. Perhaps you know the beatitudes, also called the sermon on the mount. You can find them in Matthew 5:3-12 and in Luke 6:20-22. "Blessed are the poor.." and so on. Pier Giorgio had a special place in his heart for the poor from a young age, when at four years old he is reported to have spontaneously given his shoes to a pauper child in need. He was a devout follower of Christ all his life, without the support of his family. At his funeral after a brief illness and sudden death from poliomyelitis, thousands of the poor whom he had helped lined the streets to mourn his passing, surprising his parents who knew nothing of the extent of his preferential option for the poor. There's so much more to his story than what I've written. 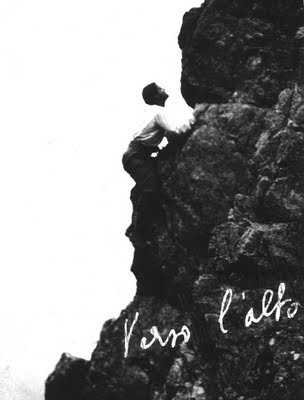 What impresses me, and the reason I wear a wrist band with the words "VERSO L'ALTO" is that this man reached toward the heights physically by climbing mountains, and reached greater heights in life by stooping to help the lowly, quietly and with nary a speaking gig to show for it. I've got no time for people who don't play full out. I've got no time for people who don't give it their all. Whether it's the morning paper delivery, or the drive-thru attendant, or a famous entertainer; I'm a big fan of anyone who respects their audience, their sport, their vocation or chosen career and their employer. I've worked with people who deliberately give less than their best, even in their lame excuses. "I'm hung over, I'm tired, I guess I'm under a lot of pressure..." well boo-flipping-hoo! I heard once of a hung over cook who was asked at what percentage she thought she might be operating, the morning after a bender. "Sixty per cent," she replied with a moan. "Great, that's what I'll pay you," said her boss. "Sixty per cent of your hourly wage." She perked up and if she ever came to work hung over again, no one knows and no one cares. I knew a manager who used to ask us, "If you paid $100 for a ticket to see a performer and they just 'phoned it in' (gave a mediocre performance), would you feel ripped off?" Naturally, any of us would. "Well," he'd say, "Those people pay good money for a meal at this restaurant. Give 'em what they came for! Every time!" Play full out. "Verso l'alto", my friends, in all that you do. Head toward the top. Father Thomas Dowd, former young telecom Exec who answered God's call, and the first Catholic priest to blog, will be ordained the Auxiliary Bishop of Montreal. He will be the youngest bishop in Canada. If ever I wonder that there can be a connection between business and faith, Father (soon to be Bishop) Dowd reminds me that God calls us from wherever we are, and sends us to wherever he needs us to be. We have but to listen. Thanks for Your Resume - now F*** Off! Thanks for your resume, now f*** off! OK, so no one's ever said that to me exactly. And sometimes that's exactly what the comfortably employed mean to say to the underclass who dare to presume they might someday join their midst. I was surprised to learn of the behaviour of a major Canadian company recently, I am sorry to say, who effectively behaved just that way to a good friend. A man I know, well educated, well experienced and well respected responded to an opportunity on LinkedIn. I would suggest that he was almost uniquely qualified for the position. He submitted his resume with a cover letter and then followed up. This guy's a pro; the kind of guy you want working for you, the kind of guy you want in your corner. He reached out to an executive in the company, a man he had not seen in years but with whom was once a friend and professional associate. He researched the company, properly prepared his position, made contact on several levels, followed up, followed up again, requested a meeting with his executive friend, and waited for a response. Hell, he waited for an acknowledgement. Nothing. Nada. Zilch. Bupkis. This is the kind of guy who sells to company presidents and has no trouble in the company of the influential. Some might count him as being one of the influential people in his profession. This is also the kind of guy who knows crass behaviour when he experiences it. This guy doesn't need a job, he's doing very well where he is. What he craves is a challenge, a place to spread his wings and grow, a place to practice his career of excellence. What he got was rudeness in return. What the company lost was goodwill, and their reputation. My friend forbade me to use their name, but I can tell you that now there are two of us that will never do business with them again. It won't bankrupt them, but this continued behaviour could. He wouldn't accept a job with them now, not out of spite or anger but because he won't be associated with such a culture of disrespect. He certainly won't recommend them either as a place to do business. You could blame it on the actions of one, two or three people in the company (that's how many his resume would have reached, minimum) however the pattern indicates that it's deeply ingrained in the corporate culture. "We don't need you, we're doing you a favour, thanks for your resume, f*** off!" I suggest it would be good corporate and personal policy to be respectful to every candidate, every applicant. A simple "thank you, no thank you" would go a long way in differentiating a company. They have invented the technology to do it by email if postage costs are a worry. Look, I'm a professional sales guy, a pretty good one. I do OK. Rejection is my stock in trade, so to speak. Certainly it comes with the job. If I'm not getting rejected regularly it's because I'm not trying hard enough; not reaching for more. I can handle rejection and so can my friend. I just can't abide rudeness. I use three social networks primarily - Facebook, Twitter and LinkedIn and occasionally Four Square. I don't differentiate strictly, although naturally Facebook is more for family and friends, and LinkedIn is strictly business. They meld, and so I am careful not to post identical messages in all three, just to avoid filling someone's page with, well...me. These social networks are sources of leads for me, as a salesperson. They are a way to keep up on what's happening in my friend's lives. They are a way to keep current on my profession, and our world. Here's what you can do to assist me, since it is all about me. Isn't it? Keep telling me where you are via FourSquare, especially if you're my competition. It helps me to get a feel for your sales activities, your target market, your techniques. Hint - it's especially helpful when you name the client you're taking to dinner, if for no other reason than I'll take her to a different restaurant when I'm in town. Keep tweeting reference material like articles and white papers. That way I know what you're about, I know you're serious, and you keep me on my toes. What you tweet tells me a lot about who you are, and what motivates you. I can talk to your interests, and you to mine when we're fully engaged on social networks. Please keep your LinkedIn profile up to date. Seriously, it's my on-line rolodex. I need your address and phone number if we're going to catch up for a beverage next time I'm in town, or if I just want to call and say hello. I'd have to say this is the most neglected social network but the it's the one that has the most potential to reach and be relevant. I love your Facebook pictures and status updates; no really, I do. No matter what we get into professionally, it's important to keep it all in perspective. If it's important to you, it's important to me whether you're my client or my competition - social networking reminds us that in real life, we're friends. 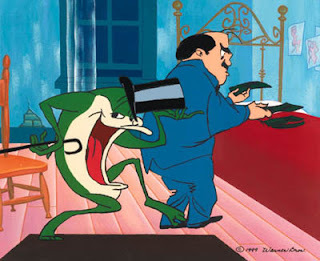 One of my favourite Warner Brothers cartoon involves a man and a frog - you know the one. A construction worker discovers a remarkably talented frog in a time capsule, figures the frog will make him a millionaire, sinks everything he has into it, and when it comes time to perform, the frog doesn't. Beyond being one of the funniest cartoons ever, time and time again that sneaky man with dreams of a shortcut to easy street shows up in real life, all over town. Every time I'm faced with one of these "no work, big money" schemes, all I can hear is that frog singing in my ear. Local Networking Events - every time I attend a Chamber of Commerce networking event some sales neophyte gets hold of my card and tries to convince me that my organization, one of the largest in our little town, should do business with them. Maybe we should, but why do they imagine we're going to drop our current provider for someone we've just met? Maybe it could happen, but I wouldn't start counting the cash yet. So for the umpteenth time - I'm not a decision maker, I'm just a sales guy. You can tell me how well your frog sings, or you can tell someone who cares. Pyramid Selling - OK, I'm in sales, and I'm pretty good at what I do. What makes you think I'm going to give it all up to buy from you so I can recruit a bunch of someones to buy from me until eventually someone finds an end user to buy a product no one wants? This frog doesn't sing for just anyone, fool. Plus, I'm not that into frogs: Know Your Market. I'm thrilled that we live in a world where frogs can just belt out a tune anytime they feel like it, and I admit we've come a long way; congratulations. I'm just not that into frogs, which doesn't, by the way, make me ranidaphobic. I didn't say I was scared of frogs, I said I wouldn't pay to hear one sing. Tradeshows: I'm a Sales Guy. If you're Talking to Me, Get out your Wallet I'm not saying I don't have some connections that you, my fellow salesperson, could benefit from, but that's not why I'm here right now. If you can't buy from me, and I can't buy from you, could we both just get out of each other's way while we talk to actual customers? I promise I'll buy you a coffee some day soon. Plus, it cost my company a lot of money for me to be here. I feel sort of obligated to make some of it back. I know my company could probably use your fantastic product, but since you didn't buy booth space and I did, I'd appreciate it if you could take that stupid frog someplace else. There's a saying, "a little knowledge is a dangerous thing," oft thought to be a warning to the aristocracy to keep the proletariat in the dark, for if the unwashed had even a little knowledge it might spark a revolution. A little knowledge is a dangerous thing, because a little knowledge is not enough. In fact, it is arguably dangerous to proceed with only a little knowledge. Yet we purchase, make medical decisions, and choose education for our children based on a little knowledge. We elect based on a little knowledge, we run for office based on a narrow idealism and a little knowledge, and we condemn others based on only a little knowledge, we reject (or embrace) religion based on a little knowledge. Worse, we hold in contempt those who have pursued a higher education beyond the norm. Witness the last Canadian federal election in which the ruling party effectively turned public opinion against a credible opposition because, besides his crime of having pursued a career outside of Canada, their leader dared to ask, dared to know. Yet, overwhelmingly, the educated and the worldly are the ones who have the best opportunity to turn the word's attention to the needs of the many, and in fact are the ones who are more likely to show a preferential option for the poor. They are the ones who can influence policy, and do. The Rhodes Scholarship "requires that the candidate be a well-rounded individual, having shown not only academic excellence, but also active engagement in their community and evidence of a strong commitment to leadership in improving the state of the world." Andrew Wilkinson, Canadian National Secretary, Rhodes Scholarship Trust. These Canadians are Rhodes Scholars, to pick a few from the many who have made and are making a difference. I should confess, in this world of educated, uneducated and uber-educated, I fall somewhere towards the lower end of the scale. I am schooled in my craft with a measure of theory, a sprinkling of practice, and a heap of experience. John Turner - MP, former Minister of Justice responsible for reforms in the way Justices are appointed. Canadian Prime Minister - He used to sit in front of us at church. He'd tousle my oldest son's hair and call him "sport" and "champ". Marc Kielburger - with his brother Craig, challenging the world to "Free the Children"
Bob Rae - MP, MPP, Ontario Premier, current interim leader of the Liberal Party of Canada - is it possible he may be the best Prime Minister we'll never have, joining the likes of David Lewis and Robert Stanfield in the great "what could have been"
Roland Michener - Ontario MPP, MP, Speaker of the House, Governor General of Canada, populist, fitness enthusiast - I met him once when he came in to get a haircut at Jimmy's wearing his trademark retirement track suit, still looking great at 85. I was in awe; I could barely choke out a "good morning, your excellency." I still remember the Star Weekly interview with him, in which the reporter was invited to join Michener on a morning run if he wanted an interview. Thirty years his junior, the reporter could barely keep up with Michener. Rex Murphy - studied at Oxford, this CBC commentator is thoughtful, provocative and a defender of democracy and of the little guy. This Canada runs the risk of being a tale of two solitudes, the uninformed and the educated, in the fashion of Dickens' Tale of Two Cities, in which the poor rise up against the aristocracy. We ought not to hold the educated in contempt, but listen to them critically and welcome higher debate and an intellectual meeting of the minds for the good of the many. I came to the crashing realization this month that I might be a few years older than most of my co-workers, professional associates and Facebook friends. Who am I kidding; a few years older? A few decades! Oh sure, I guess I always knew that I might be the only one on the sales team who's ever seen an original episode of The Brady Bunch or Star Trek. And sure, when my friends' nostalgia has them pining away for sitcoms I have never seen because I was too busy working every night in the nineties, I feel like a pretender. Seriously though, who names a kid Topanga? The gulf is wide - I have friends who can't remember a time when John Travolta wasn't fat. 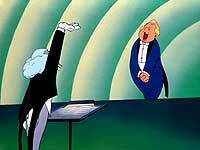 Co-workers who have only seen the short version of Bugs Bunny cartoons, and who don't believe me when I describe the entire bullfighter episode as it was meant to be seen, or the opera singer versus the banjo playing Bugs. I don't think any of them have the attention span to wait for the payoff. Kids, I mean friends, there is nothing funnier than a fat Opera singer getting his payback. You have to see the Bunny on the losing end of encounter after encounter to fully appreciate the brilliance of his final revenge. I doubt you could find a television network willing to go the full length of a Bugs cartoon between commercials these days. I work hard not to start a sentence with the words "in my day," but more and more I can't help myself. What really brought the age difference home these past few weeks were the Facebook status updates, of which I'd like to say two things. 1. 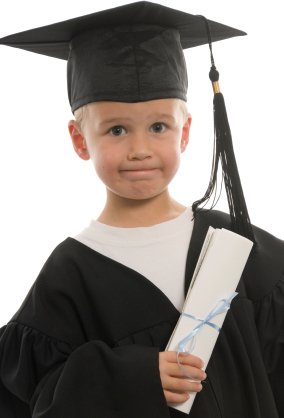 I don't believe that all of your children graduated with honours from Senior Kindergarten or even their Grade 8 class. I'm not calling you liars, just seriously deluded. They can't all have graduated top of their class! That would be like suggesting that no one came in the bottom, which would imply that no one has ever had to face the harsh light of failure, or second best, or last place. That ain't right. In my day we got our asses kicked once in a while. Things can't have changed that much, have they? 2. When my co-workers and peers share pictures of their kid's high school graduations, I feel a bit old. My oldest kid graduated from high school the same year Topanga eloped with Cory. (OK, I might have seen at least one episode of Boy Meets World). Funny enough, I don't feel so old around all my friends having their very first babies. At least two of my kids are of marrying age. Maybe it won't be long before we're posting baby pictures, too. Will it? No really, how much longer are you going to make us wait?!? Kids, by the time your mom and I were your age, we already had you. I'm not getting any younger here. Corey and Topanga didn't keep their parents waiting this long. I've spent a lot of my life working in the kitchens, dishrooms and dining rooms of some pretty fine establishments, and the restaurant biz remains my first love. I'm naturally drawn to it, to write about it, and to relive it in rose coloured hindsight. I've also had a hell of a good time in the hotel side of the hospitality industry, and I've discovered a whole new world right next door. If restaurant managers had the first clue what hotel managers do, there'd be a revolution. Hotel Managers have a great deal of autonomy. They take it upon themselves to see that the guest is truly satisfied. Maybe that's because they have them overnight, while restaurant managers only have them for a couple of hours at best. It changes the way you think about someone when they're spending the night, or several days. The restaurant manager just doesn't have as many tricks up his sleeve, and he certainly doesn't think long term. You treat a customer differently when they're not going anywhere anytime soon. Where the hotel can upgrade a guest to a nicer room, or send an amenity, the restaurant just doesn't have that inventory to work with. Or do they? Is there a way to "upgrade" a favoured client, perhaps with premium booths, reserved parking some other sort of premium service or product? Hotel Managers focus on every aspect of the guest's needs. They see the guest holistically, so to speak. The guest is more than a just customer with an appetite, which is all a restaurateur might see. He's also tired, or stressed, or far from home for a long period of time. She needs to feel safe, he needs a place to work out and to relax...they don't just arrive in a hotel with only one need. Can a restaurant look beyond the obvious and offer the unexpected? Free wi-fi, free use of an I-Pad, a newspaper from any home town in the world (it can be done). Concierge service in a restaurant? Why not? Wouldn't it be cool if the restaurant host or Manager knew where the hottest bar was, or what movies were playing, or the best place for a decent breakfast tomorrow morning just the same way the hotel concierge is expected to? What if you could order theatre or concert tickets right from your table? The concierge will arrange it in any decent hotel. 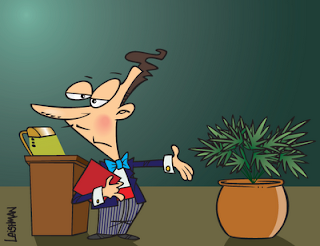 Isn't it time we combined the role of Maitre D' and Concierge? Proactive vs. Reactive Hotel Managers proactively plan for every guest, and are better equipped to handle the unexpected because of it. The hotelier is always thinking at least 12 hours ahead, and in reality is looking days, weeks and even months into the future. The restaurateur is usually trying to take care of the business directly in front of her at the moment. Sure, the average restaurant guest does not make reservations 30 days in advance, but planning is about more than that. Revenue managers in the hotel industry release inventory to third party wholesalers in slow periods - what if restaurants did the same? Forecast out and based on trends and known local events, offer packages or specific deals on line? What if instead of forecasting a downward trend in sales and shrugging your shoulders, one translated that to be a downward trend of, for example, 20 customers a night and began a dedicated effort to capture exactly 20 more customers through available channels and creative means? We're always chasing money like it walks in the door by itself. It doesn't. There's a person attached. Maybe we could focus a little less on the money, and more on the person. Hotels know that when a hotel room goes empty, it's spoiled inventory since tonight will pass by and never happen again. Restaurants understand spoilage in the kitchen, but I don't know many restaurateurs who look at empty tables in the restaurant and shake their heads at the "spoiled inventory" right in the dining room. What if they applied themselves to the task of ensuring that every table is filled, every night, several times over. It's called "turnover" and that's a word used to describe historical activity. Do we even have a phrase like "projected occupancy" that we apply to our planning model in a restaurant? Hotels have dedicated sales people to bring in group business, or entice individual corporate travelers. I think most restaurants, even the larger ones, would consider that to be a luxury, or a "fluff" position. If only they knew about hotel sales people who bring in 10 to 100 times their salaries in sales. How much could be accomplished if the restaurant viewed that as a real job, not just a project assigned to a junior manager. Maybe a chain with two or three locations might see the value in having a sales person whose only job it is to make sure that the sports teams eat there, or the office parties are booked and serviced, or the wedding showers or rehearsal parties were planned and executed perfectly. That's exactly what's happening in hotels while restaurants leave it to chance, and to word of mouth. What if a national restaurant chain had a national sales team, not to look for franchisees, but for customers? I compare these two different business models in the same industry because it's what I know. But in the past when I worked two jobs to support my family, I applied the skills of car sales to bartending and achieved some very profitable results - so much so that I walked away from selling cars but still use those skills in hotel sales today. Product knowledge, never sell on price alone, test drives...it translates into any industry, I'd wager. What can we learn from someone who does what we do, in a different capacity or in a different industry?